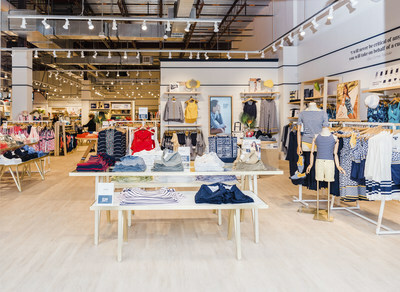 Lands' End Opens Store in Pittsburgh | Lands' End, Inc.
DODGEVILLE, Wis., March 26, 2019 /PRNewswire/ -- Lands' End, a leading retailer known for high-quality apparel for the whole family, returns to Pittsburgh, with a company-operated store at The Block, a lifestyle center located at 6254 Northway Drive. The new store offers the iconic brand's apparel, including swimsuits for men, women and kids, activewear, and accessories. The Grand Opening celebration begins with a ribbon-cutting ceremony supported by the Pittsburgh North Regional Chamber on Saturday, April 6, at 10 a.m., with activities continuing throughout the weekend. "We are excited to return to our customers in Pittsburgh and look forward to introducing the community to our first company-owned store in Pennsylvania," said Claudia Mazo, senior vice president of retail, Lands' End. "The store is conveniently located where our customers live and work so they can easily combine a Lands' End store visit with the many other activities that are happening at The Block." The new store design is a nod to Lands' End's nautical heritage, with a fresh, crisp and modern take. The company colors of true navy and white appear throughout the store. As customers enter, they're greeted by a gallery of product, images and streaming video that brings the Lands' End heritage, products and company initiatives to life. Inside the store, shoppers can browse the full Lands' End collection of spring and summer products at landsend.com. Store orders come with free shipping and online orders can be returned to the store free of charge. The public is invited to join Lands' End in the celebration of its new store on Saturday, April 6 from 10 a.m. to 4 p.m. and Sunday, April 7 from 11 a.m. to 4 p.m. The first 100 customers will get a free gift of a Lands' End tote with a purchase of $100 or more. Outside the store in the common area, shoppers can visit the Lands' End Airstream. The Airstream is designed as a traveling Seagoing™ Duffle to celebrate more than five decades of Lands' End and its loyal customers. During the Grand Opening, shoppers will find a range of products available at the Airstream. Kids can color an iconic Lands' End lighthouse drawing. Each child who brings their drawing into the store will receive a free keychain tote, plus, Lands' End will display their artwork inside the store. To find the Lands' End store nearest you, please visit the store locator on landsend.com. Lands' End, Inc. (NASDAQ: LE) is a leading multi-channel retailer of casual clothing, accessories, footwear and home products. We offer products through catalogs, online at www.landsend.com, international websites, third party online marketplaces and through retail locations. We are a classic American lifestyle brand with a passion for quality, legendary service and real value, and seek to deliver timeless style for men, women, kids and the home.